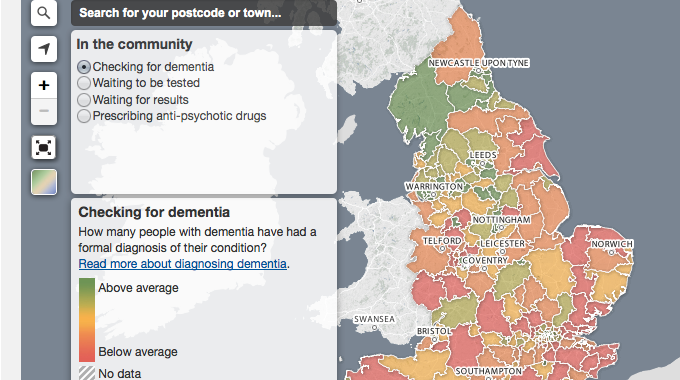 Putting dementia on the map published by the Department of Health draws on data and information about dementia health and care, dementia friendly communities and research. It highlights where improvements are being made and where we can see progress, but it also shows where we need to improve, including where we need better data. This map highlights how long you might expect to wait for diagnosis or treatment at a memory clinic. It also shows how effective your local clinic is at making a diagnosis and how this compares with the overall level of dementia in your community. This map shows how alert your local hospital is to dementia, what the prognosis is for those who are admitted and how long are they likely to stay. This map shows how many people are expected to be living with dementia in your area in the future, based on local prevelance rates. It also shows which towns and counties have signed up to become Dementia Friendly Communities and how many research studies into dementia treatment and care are being run by memory clinics. Much of the data shown on the map is provided voluntarily by health and care providers and local communities. This means that for some maps, there isn’t enough information about particular areas to give a representative view. If you are a trust, a CCG or another organisation, and you believe the data shown for your area is inaccurate, please email scp-dementia@dh.gsi.gov.uk. The map is being published at the same time as a report, ‘State of the nation report on dementia care and support in England’, which follows on from the Prime Minister’s Challenge on Dementia published in March 2012.